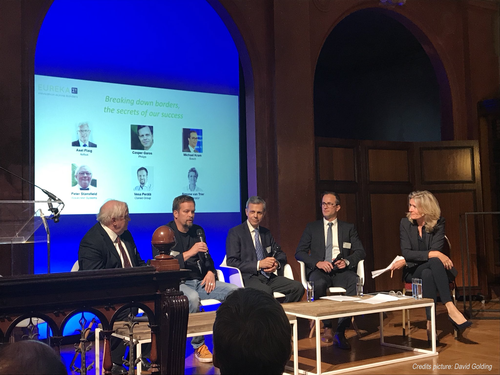 On 26th September 2018, EUREKA hosted an event entitled Innovation Across Borders “Faster-Further-Together” at the Bibliothèque Solvay in Brussels. Jean-Eric Paquet, European Commission Director-General of Research, and Tim Bestwick, Chair of the EUREKA Network, jointly opened the proceedings. Two business leaders, Bosch and Philips – both members of the ITEA Board – participated in the panel discussion ‘Breaking down borders, the secrets of success’. The industry representatives support EUREKA as an efficient international funding instrument through which industry and national authorities work together to enable projects with high economic and societal impact. Europe has a strong history of successful trans-national technology collaboration. The future Digital Economy requires this strategy of shared innovation to be strengthened and deepened if Europe is to remain globally competitive. By bringing together the best of European talent and technology in focussed projects, the ecosystems of the future are being formed – from which commercial success can be developed and built on. Collaborative innovation is one of the most effective mechanisms for addressing the application and industrial challenges of the future in critical areas such as Mobility, Health and Advanced Manufacturing. Such collaborative projects also include partners that address the need for essential capabilities such as intrinsic security and enhanced connectivity. Europe has a vast talent pool, with the capability to draw on complementary skills and knowledge from large companies, SMEs, research institutes and academia. Moreover, this collaboration integrates the full value chain from suppliers of core technologies to those developing end-user applications, which increases the likelihood of success for end-products and services. The EUREKA network is particularly relevant in this context, where global collaborative innovation is a key driver for growth, as EUREKA spans forty countries from five continents and offers access to foreign markets through its collaborative projects. “The EUREKA programme, notably the ITEA and PENTA clusters, enables and empowers strong innovative ecosystems to address societal challenges. Together we are driving the digitalisation of healthcare, improving quality of care and targeting affordable cost levels. The programme also lowers barriers for SMEs to enter into the value chain, providing direct access to potential business opportunities at European and even global scale. The strong collaborative nature of EUREKA is something that the industry highly values.’’ stated Casper Garos, Head of Public-Private Partnerships, Innovation Management, Philips. “Bosch aims to tackle global societal challenges through technological innovation. To achieve the best possible results, we engage in collaborative projects in many of our research and development areas. By bringing together international partners along the entire value chain, EUREKA programmes are important facilitators of groundbreaking innovations. As one of the world’s most innovative automotive suppliers, Bosch welcomes the chance to develop new technologies and methods – such as for connected and automated mobility – in collaboration with our EUREKA partners,” added Michael Kram, Vice President Systems and Advanced Engineering, Chassis Systems Control, Bosch.